Some engineers are always keen to rebuild aircraft. Recently, NASA teamed up with scientists at the Massachusetts Institute of Technology (MIT) to develop a deformed wing made up of thousands of small modules that look like a piece of dragon and can automatically adjust shape to control aircraft flight based on changes in the surrounding environment. The aerodynamic efficiency is highest at each stage. The official name of the aircraft is called a fixed-wing aeroplane. As the name implies, the wing that controls the flow of air to generate the lift of the aircraft is a fixed structure. There is another separately operable movable surface at the trailing edge of the wing. The outer side is called the aileron, which is used to control the rolling motion of the aircraft. The inner side is the flap, which is responsible for increasing the lift or resistance during the take-off and landing phase. You just sit in the window near the wing and you can see that the ailerons and flaps will tilt up and down during the flight. The aircraft has different optimal wing parameter values ​​at different flight stages (takeoff, cruise, high-tech operation, landing, etc. ), but the traditional wing is made of metal and composite material, rigid and non-foldable, and very heavy, from design The cost of manufacturing to maintenance is very high, and there is no specific design for a certain flight phase, so it is bound to sacrifice some aerodynamic efficiency. However, a wing that automatically deforms as the environment changes will provide the best experience for each flight phase. NASA and the MIT team have now successfully designed this prototype: a deformable wing that automatically changes shape as the surrounding stress conditions change. 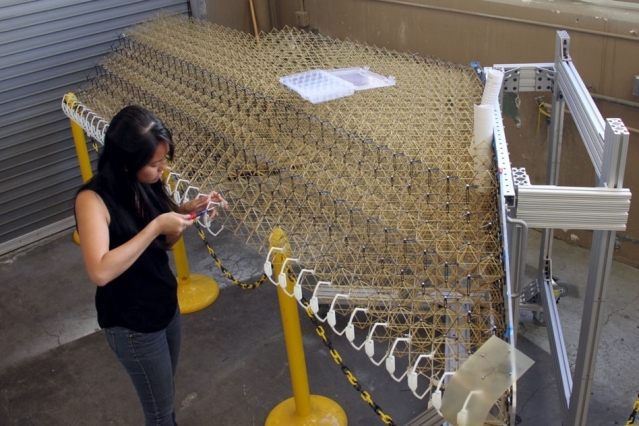 The new wing is screwed into a lattice frame by thousands of tiny triangular struts, and the outermost layer is covered with a polymer-like material. The special design allows the wing to bend in a specific way according to specific types of stress conditions, with conventional wings. Stiffness, but mild and very low density comparable to aerogels. To make a comparison, the density of the new wing is 5.6 kg / m ^ 3 and the density of the rubber is 1,500 kg / m ^ 3 . The researchers say that because the overall structure of the wing is based on smaller subunits, it doesn’t matter what the lattice shape is. You can choose the most suitable geometry according to your needs. This technology can be applied not only to future aerospace vehicles, such as The fuselage and the wing are integrated into the hybrid wing, and can also be used as a new type of rotating blade for wind turbines, a new type of bridge structure, or a self-assembling instrument in space.